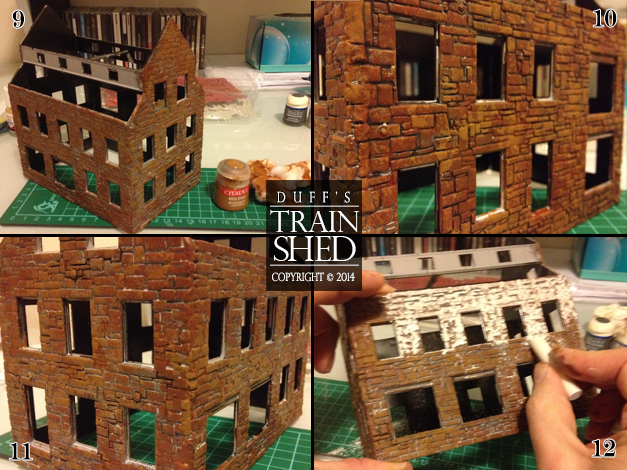 My completed structure positioned on my layout. I have always loved Railway Design Associates’ (RDA) structures; especially the way RDA presents its models on their packaging – that rustic water colour finish – brilliant! The kits are great and I have really enjoyed working on them. Yes, you need to do a tiny bit of kit bashing, but it’s minimal and not at all difficult. If anything, it makes the experience more rewarding, and let’s not forget that these are craftsman kits. 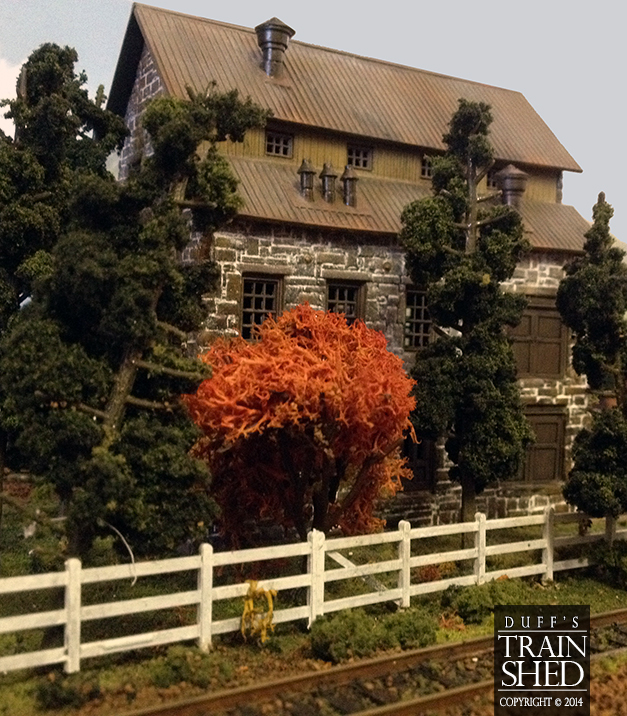 These kits can be purchased from the Railway Design Associates’ website, and Matt Gutherie (son of Rod Guthrie who designed and sculpted many of the kits) was very helpful when I emailed him questions. I was surprised at how fast the kits arrived in my post box in Brisbane Australia all the way from the USA. The near completed stone building – awaiting its chimneys and touch ups. 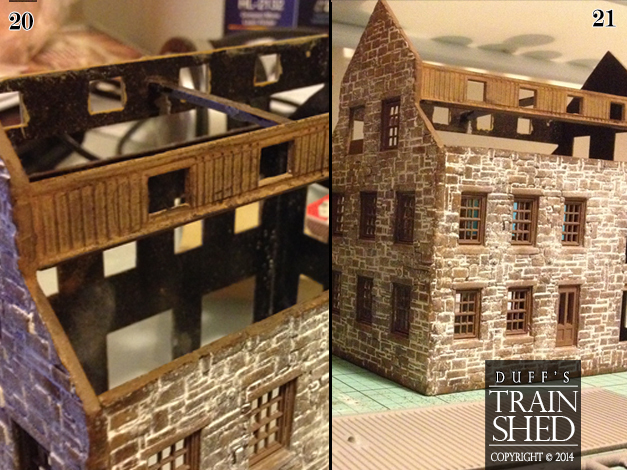 Below, I have blogged my approach to constructing the Delaney Iron Works stone building. My goal when building this structure was to acquire an aging effect; of weathered stonework, leached lime, crumbling and cracked mortar, and a rusting roof. I am happy with my result and believe I have achieved this to a fair degree. Some modellers have commented that the window bars of this RDA structure are too thick and out of scale. Perhaps this is true, however I’m not quite the ‘rivet counter’ and so it does not bother me at all. Personally I think they look fine. This is my first blog and I hope to write about my other kit building/bashing efforts when I find time amongst juggling work and family. I am not a professional modeller. In fact, many of my efforts have gone horribly pear shaped and are worthy only of the rubbish tip. However, I continue to study the techniques of more experienced modellers in the hope that my skill with modelling will improve. I hope others find my blog useful; especially if they like the finish of my stone building and they wish to achieve something similar. I welcome feedback and criticisms, so please leave a comment at the end of my post. Close up of end wall. Read below to see how I created this structure. Below are the materials I used. A professional modeller or craftsman may use less materials to achieve the same or similar finish. 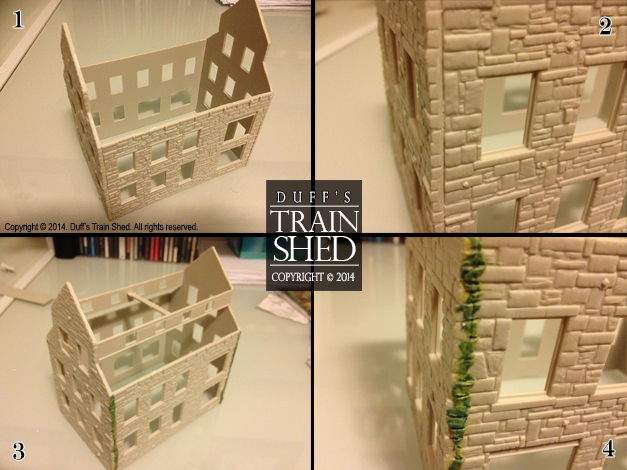 Figure 1 – The four walls were glued together using Revell Contacta Professional. I used a number of sanding blocks to keep the structure square. Figure 2 – Many modellers have posted their disappointment at the large join that runs vertically down each corner of the long sides of the structure. I agree, this does distract from the structures beauty, however, this is easily remedied with some putty and quick knife work. Figure 3 – I added the upper clerestory walls and then glued a supporting beam horizontally between them. This cross beam not only helps to strengthen the structure but acts as a support to hang my internal rice grain light at a later stage. In hind sight I should have waited until the lower roof pieces were in place before assembling the clerestory walls as I had to remove the clerestory walls at a later stage in order to fit the lower roof pieces properly. I then pushed Citadel Green Stuff (putty) into the corner joins and used a pen knife to carve stone edging into the putty. Figure 4 – As you can see my knife grooves are not straight and I probably could have done a better job of this, however, in hindsight I realised that this actually suited the crumbling effect I wanted to achieve in the finish. 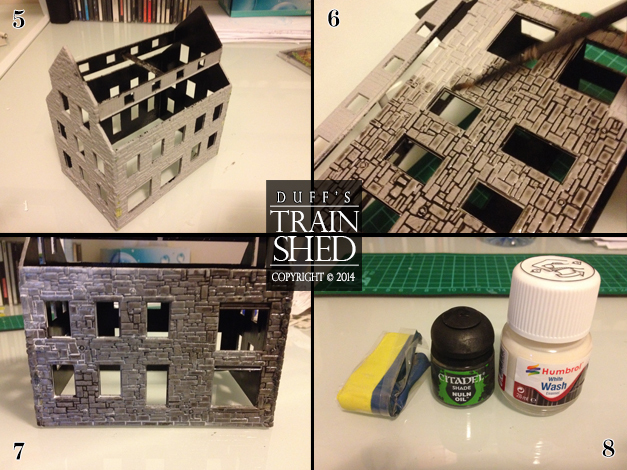 Figure 5 – First I sprayed the internal walls with matt black primer and then I sprayed the outer walls with Citadel grey primer. 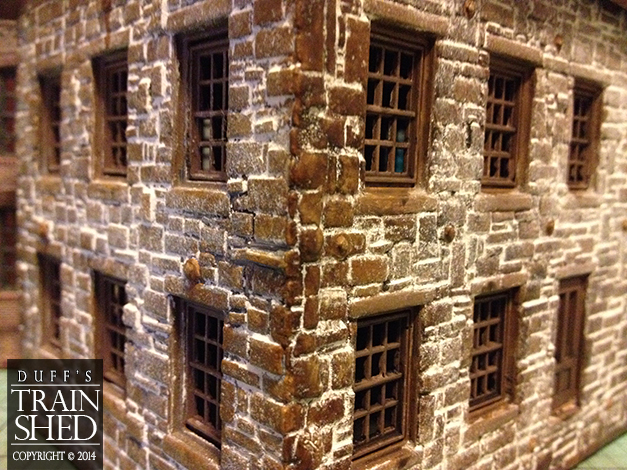 Figure 6 – Once the primer had dried, I then ran a wash of Citadel’s Nuln Oil across the brickwork, using a wash brush, the idea being to get the wash in the mortar cracks, however it does not matter if some of the wash stays on the stonework. Figure 7 – Once the wash was dry, I then dabbed Humbrol white wash onto selected areas of the stonework using cotton wool and letting some of the wash run into the mortar cracks. The idea was to get some of the the stone work lighter and to increase that leaching effect in the stone work’s mortar. This worked a treat and where the black wash remained in the mortar has given the appearance of grout falling away in end result. Note: Humbrol White wash is enamel based and dries with a wet look. If you follow my method do not be concerned about this as this gets covered up later. Figure 8 – Citadel Green Stuff, Citadel Nuln Oil and Humbrol White Wash Enamel. Figures 9, 10 & 11 – I began by lightly dabbing Citadel Steel Legion Drab, Citadel Mournfang Brown and Citadel Snakebite Leather paints onto parts of the walls using cotton wool. The idea was to get as little paint as possible in the cracks where the black and white washes resided. I tried to create a sort of camouflage feel, similar to what I might do if I was painting an armoured vehicle. I let each colour dry before dabbing on the next. Figure 12 – After letting the paint dry, I then began chalking the structure with white chalk. The idea was to get as much chalk into the mortar cracks as possible- really rubbing it in. This process not only got the lime leaching effect happening, but it also helped to tone down the vivid browns. Figure 13 – I covered the whole wall in chalk, ensuring plenty got into the mortar cracks. This was a messy job and next time I do this I will definitely lay down some newspaper. Having a small hand vaccuum at the ready helps too. Figure 14 – Using my finger I rubbed the chalk further pressing into the mortar cracks. This removed the chalk from the stone work, although I found the more chalk I left on the stonework, the more rustic the building looked. Figure 15 – I then used a fine brush to take further chalk from some of the stonework. 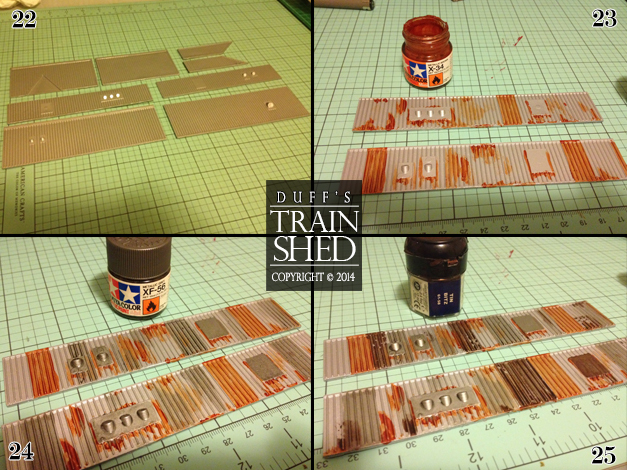 Figure 16 – A quick undercoat of Tamiya Buff on the clerestory walls to get them ready for chalking. 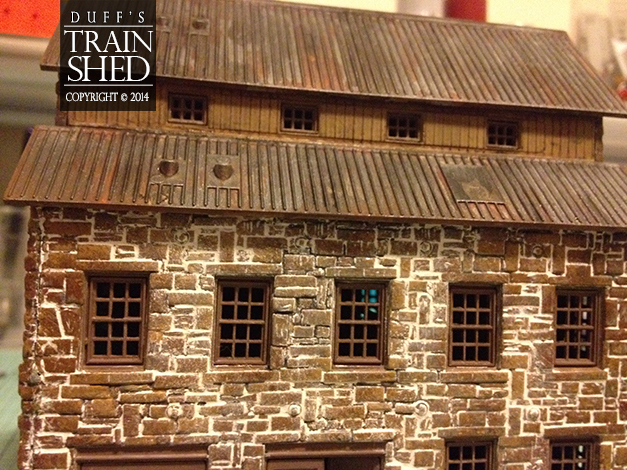 Figure 17 – While the clerestory walls dried, I spent the time painting the windows by brush with Tamiya Brown XF-72. 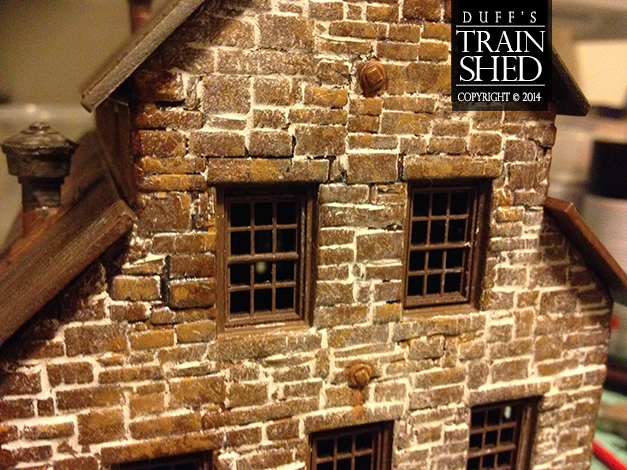 I know many modellers would spray paint the windows to retain a smooth finish, however, I wanted to give a look as if the windows had been painted over and over many times throughout the structures long life. 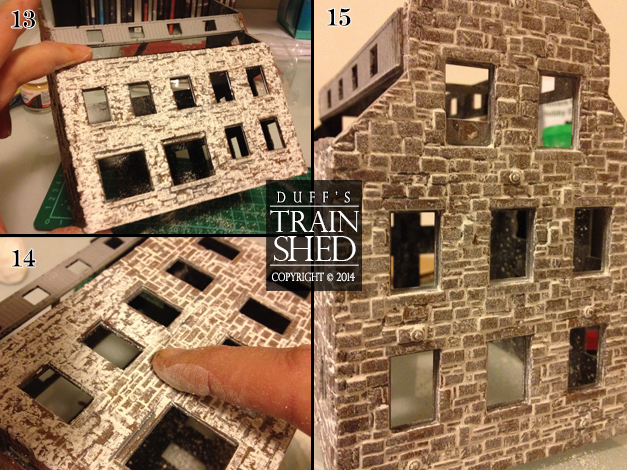 Figure 18 – Once the windows were dry I fit them by running a small amount of glue along the window edge with a matchstick end. 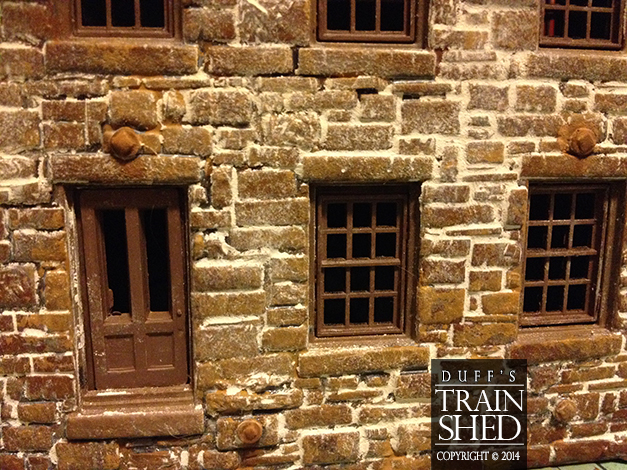 Some modellers have commented that the windows can be difficult to fit. I had no issues fitting them. Definitely test each window in its opening before gluing. I think there were two windows that I had to sand the edges slightly. Nothing to it. You will note that I do not use clear plastic on the insides of my windows to represent glass. It’s a personal choice. I prefer to keep the windows open. However, if I was to insert the clear plastic I would do it at this stage. Figure 19 – I then ran a brown pastel over the clerestory walls, smudging the pastel afterwards with my finger. Figure 20 – Finally I scraped some charcoal onto a soft brush, which I then applied over the some parts of the clerestory wall to make it darker. Figure 21 – Some modellers put a clear coat over the chalk to keep it from coming off. I do not do this. I have tried it before and with poor results. I found it tends to give the chalk a different texture and detracts. The flip side to this is that as I continue to handle the structure more chalk comes off, however, this it actually worked a treat because it brought out some of the richness of the earthy tones on the stones. If at a later date I feel too much chalk has come off I will simply add more and once the structure is positioned on the layout it will no longer be an issue. Figure 22 – I removed the roof pieces from their spruce and sanded the edges. I then sprayed the roof pieces with Tamiya Mica Silver TS-76. Figure 23 – Streaks and dabs of Tamiya Metallic Brown X-34 were then added. I tried to mix it up a bit so that some were more watery than others. Figure 24 – This was followed by streaks and dabs of Tamiya Metalic Grey XF-56. The idea was to use a number of different metallic or grey colours to represent the different stages of corrosion. In hindsight it may have looked better if I had scoured some horizontal lines across the roofing to represent different sheets of iron. 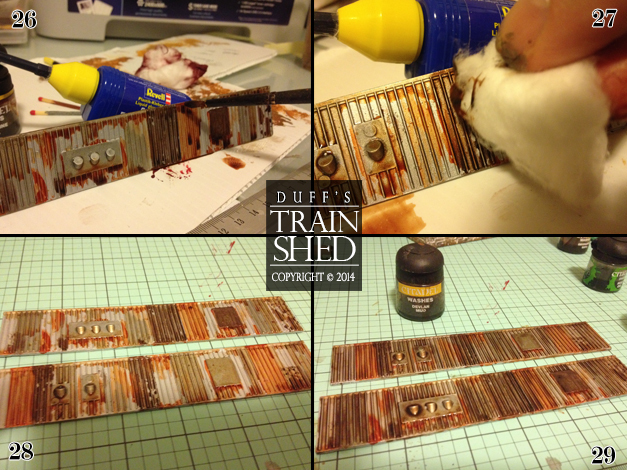 Figure 25 – I then added streaks and dabs of Citadel Tin Bitz. This colour creates a very oxidised look. 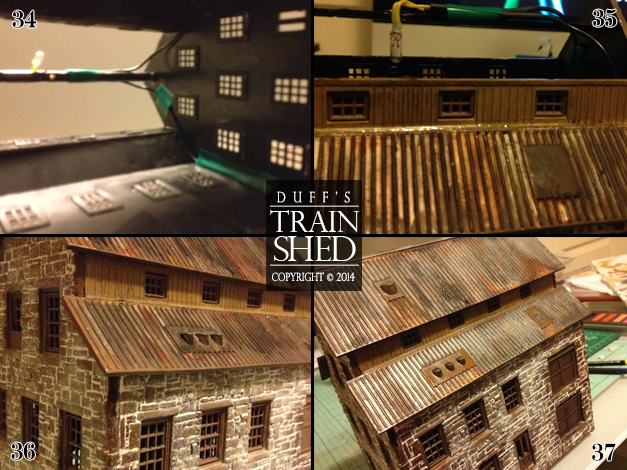 Figure 26 – After the paints had dried I stood each roof element on its long side and dabbed the top edge with Citadel Gryphon Sepia, allowing the wash to run down the plastic. I felt this would give the impression of a grime build up that might be found at the base of clerestory walls. Figure 27 – Where I felt too much sepia had blotted, I removed excess with cotton wool. Figure 28 – The two lower roof pieces ready for final washing. 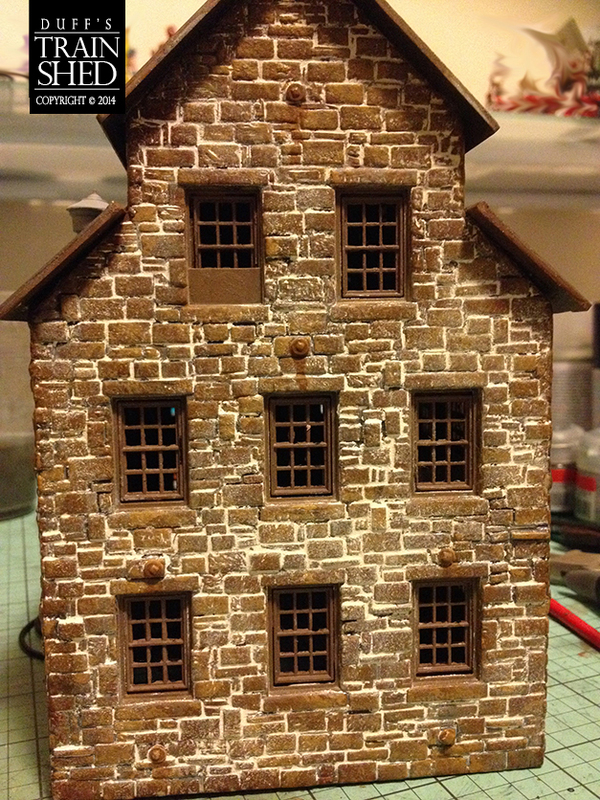 Figure 29 – To give the roof a dirty appearance I wash each piece with Citadel Devlan Mud wash. Figures 30 & 31 – I scraped some charcoal from a charcoal stick and then brushed this onto the roof until the roof looked as if it had been in a fire. Figure 32 – I then brushed and blew off off excess charcoal before gluing the lower roof pieces into place. You can see in this photograph that the clerestory walls and cross support bar were removed. I had to do this to fit the lower roof pieces properly. The clerestory walls and cross piece were then glued into place again once the lower roof pieces had set. 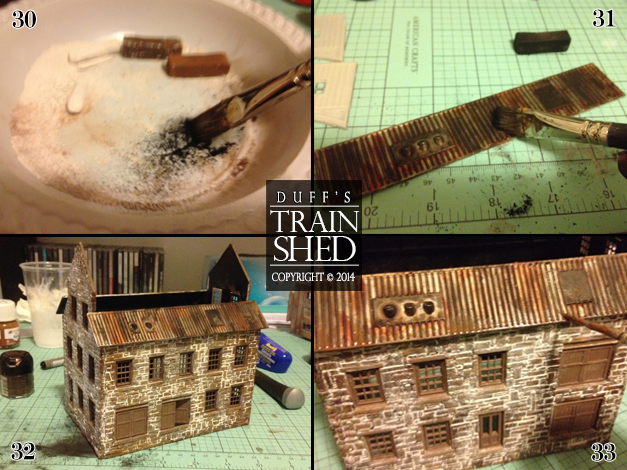 Figure 33 – With a fine brush I then added dabs of Humbrol Rust wash to the roof edges where water would likely collect. The roof at this stage looks very weather beaten and too old for the look I wanted. So I tempered this later with a dry brush of Metallic grey (see figure 37). Figure 34 & 35 – With the clerestory walls and cross beam once again in place it was time to insert my rice grain bulb. I used electric tape to hold the wires in position, however I concede that there must be a better way of doing this. I only had green insulating tape on hand at the time and I have since replaced this with black insulating tape. Had to remove the roof to again to make this change. You can see here that I had also glued the clerestory windows into their openings in the clerestory walls. Figure 36 – With the light in place, I then glued the upper roof pieces into place. Figure 37 – I then did some tidy up on the roof. I felt that it looked just to battered and rusted, and so I toned it down by dry brushing lightly with Tamiya Metallic Grey XF-56. 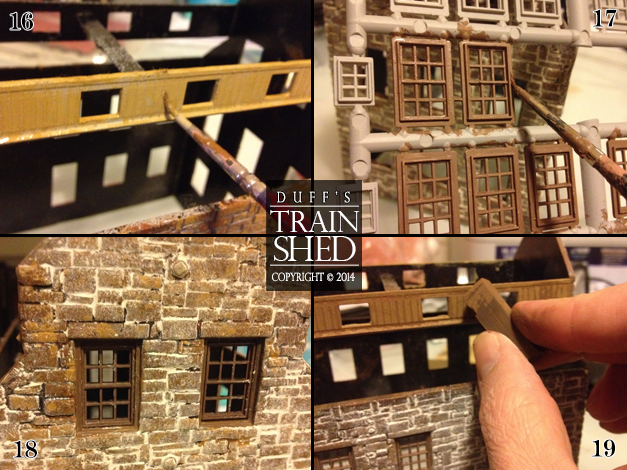 I then added some more Humbrol Rust wash to the chimney plates and roof areas directly below the plates. I considered snipping bits of the roof and buckling them but then decided against the idea at this late stage, especially given I had already done the painting. You can also see in this photograph that I have run some Citadel Devlan Mud wash over the single and double doors to bring out their detail. Below are some photographs of the completed (or near completed) structure. I am very happy with the overall result. You can see that I have also added rust runs from the bolts in the stonework. Corner view. I am glad I used putty on the corner joins. Looks much more natural. The front door. Might hang a lamp above door down the track. Thanks for reading. I hope you have enjoyed my first post and please feel free to leave comments, questions or criticisms.